An annual service is as important for a car that’s not being regularly driven as it is for one that clocks up thousands of kilometers a year, the AA has warned. With Christmas approaching, now is the time that many people will be thinking about packing up the car to head off on a long journey. And, if your car hasn’t already had its annual service, then that should be on your checklist too. It’s recommended a car is serviced once a year or every 12,000km, whichever comes first. 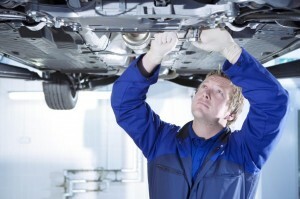 AA also advises that you have your car serviced before winter – and that applies to cars of all ages. AA Repair and Servicing Co-ordinator Pat Murphy said: ‘It doesn’t matter if you drive a spanking new 2014 car or an old run around regular car maintenance is a must. If oil is isn’t regularly changed, ‘sludge may build up which will prevent the engine being correctly lubricated’, he warned, which could result in engine failure ‘and an expensive repair’. He added: ‘Cars which have been inactive for a prolonged length of time are just as important to service as vehicles that are driven quite often. Mr Murphy said it’s important that cars are driven regularly to keep them in good condition. ‘Having your car serviced at regular intervals will help reduce engine wear, improve fuel economy, prolong the life of your engine, and will highlight any outstanding safety issues or wear and tear on suspension, steering and braking systems,’ he said. While the basic rule of thumb is to get a car serviced at least every 12 months, drivers who exceed that 12,000km annual mileage may need to book in for a service before the year is up. As part of a professional service, the car goes through a myriad of checks. In fact, the AA has a checklist of 74 things that need to be inspected. These include visual checks of the car exterior and seat belts to checking that the horn is working correctly, to the more mechanical end of things, like clutch and handbrake operation, brake fluid, oil checks, steering, suspension and lights. Mr Murphy said that not all garages will carry out the 74 checks that comprise the AA’s list, so drivers should agree with their mechanic in advance what will be checked. He advises that a brake inspection in particular should be specified for older cars and said that drivers themselves should keep an eye on the braking system. ‘Often the first sign of worn brakes is a brake pedal that seems to require more pressure to stop the vehicle. ‘Scraping, squeaking or chirping noises that come from the wheels when the brakes are applied are other signs of potentially excessive brake wear. ‘A car that pulls to the left or right when the brakes are applied could also mean trouble,’ he said. Car service prices vary, depending on the service provider, the level of service, the make and the engine size. Many manufacturers are now offering car service deals.